Line the bottom of a large shallow bowl with 1 medium head of iceberg lettuce torn into bite-size pieces. Top with 4 cups of cauliflower florets & 1 cup thinly sliced red onion & 2 chopped hard boiled eggs. Spread 3/4 cup of mayo over entire surface of salad. Sprinkle with 1/3 cup of grated Parmesan cheese & 1/3 cup of cooked chopped bacon. 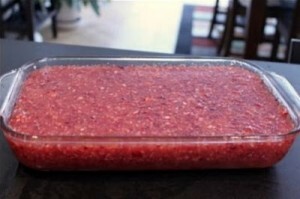 Cover with plastic wrap & refrigerate overnight. 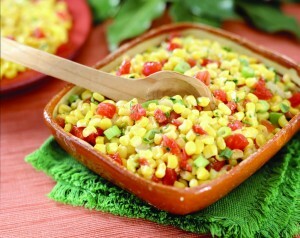 Toss salad before serving. Add 1-1/4 cup of boiling water to 1 can jellied cranberry sauce & a 3oz box of rasberry Jello. Stir. Add 1 small can of crushed pineapple, drained. Stir. Add 1/2 cup of chopped walnuts. These can be mixed in or put on the top. Chill for a few hours. Double this & you can put in a 9″ x 13″ dish. Whisk or shake together 5 tbsp vinegar with 4 tbsp olive oil. Add seasonings. Add Dijon mustard &/or chopped garlic. 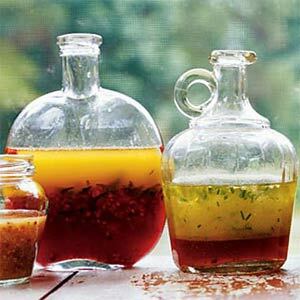 Use your favorite vinegars such as Cider or Red Wine or Balsamic. Bring 1 cup vinegar, 1/2 cup of sugar, 2 teaspoons of dry mustard & salt & pepper to a boil. 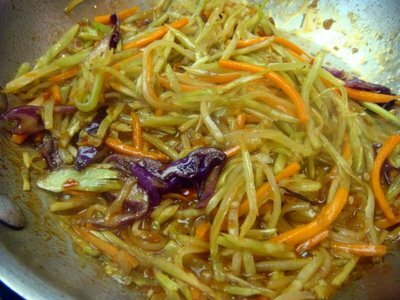 Remove from the heat & add 1 cup of vegetable oil. 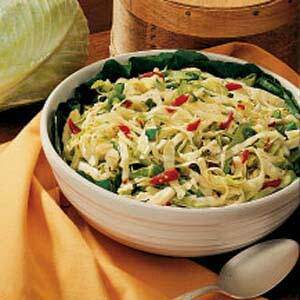 Pour over 1 large head of chopped or shredded cabbage , 1 chopped onion & one chopped green or red pepper. Mix. Cover tightly & refrigerate over night. 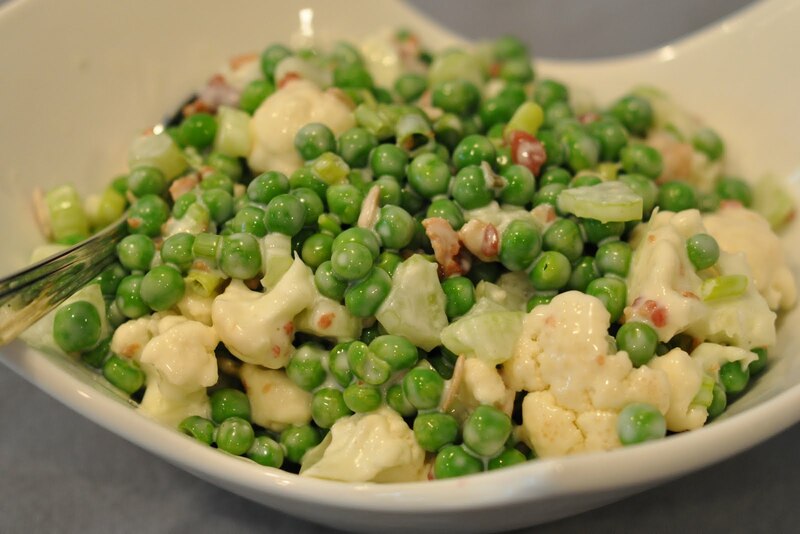 Combine 1-16oz package of frozen peas, thawed with 1 head of cauliflower, cut into bite-size pieces. 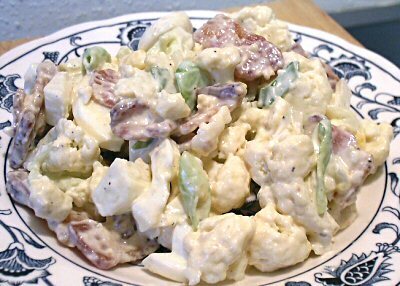 In a separate bowl, combine 1-8oz carton of sour cream & 1-1oz packet of ranch salad dressing mix. Toss with the peas & cauliflower & refrigerate until serving. You can add crumbled cooked bacon. Mix 1-16 oz can of corn (drained) or frozen corn (thawed) or fresh corn (off the cob) & 1 small chopped onion & 1 medium chopped tomato. 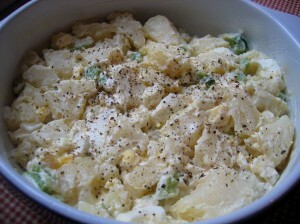 Mix in 1/3 cup of mayo & Season. Cover & refrigerate. My favorite restaurant gave me this receipe. 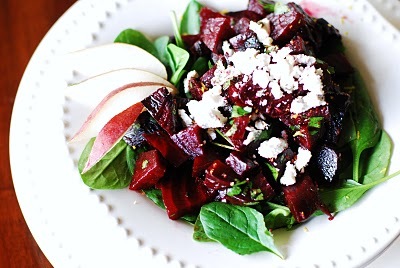 I had never cooked beets before. It’s simple. Just boil whole beets for about 15 minutes until they are tender & then peel off the skin. Mix apple cider vinegar with olive oil and whisk. Add in Liquid Smoke (the secret ingredient). Marinate the beets for a few hours or overnight. Serve over salad greens & top with Feta Cheese & crumbled bacon. Whisk the juice of 2 lemons with 2/3 cup of mayo. Add 4 cloves of garlic, chopped and a tbls of Worcestershire sauce. 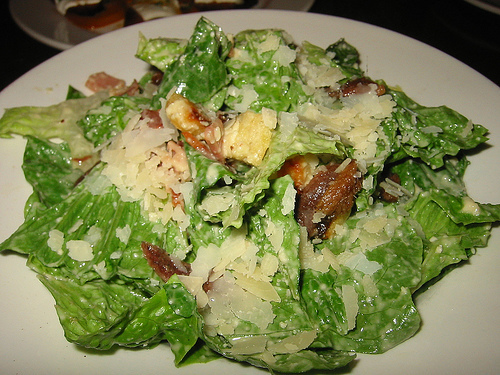 Place chopped romaine lettuce in a large bowl. Drizzle with 2/3 cup of olive oil, season & toss to coat. Drizzle lemon/garlic mixture over salad & toss to coat again. Sprinkle in 1/2 cup of grated Parmesan cheese & croutons & toss to coat well. Serve with extra Parmesan cheese on top.